Have you ever been to Tigard, OR? Well, because Tigard IS special…and even if you don’t ever visit there, you should know about them. In 2012, the City of Tigard took the first small step any city needs to take to get on the walkability wagon…it admitted it had a problem. But crucially, it then took a giant leap toward establishing a truly livable, sustainable place for its citizens – it proclaimed that it aimed to become the most walkable city in the Pacific Northwest! Ambitious? Maybe. Bold? Definitely! Below we present the story of Tigard to show how we help cities use data and analytics to more effectively actualize their visions and justify the need to do so, and by proxy, help cities attract more residents, retailers, employers, and quality developers and, increase their economic and environmental resiliency. In other words, we are not in the business of producing dust-collecting reports. We are in the business of equipping cities with the tools they need to use their (limited) time and money more effectively to help create places people love (as we wrote about in last week’s blog where we outlined how we’re helping cities reach their New Year’s Resolutions to put ON the (placemaking) pounds). Where is Tigard? All over the U.S.! 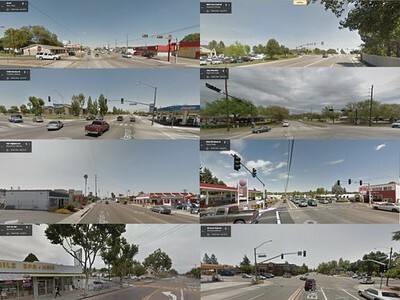 -Strip-mall lined 6-lane+ arterials -Power centers surrounded by a sea of asphalt -Pedestrian no-man lands -Cookie-cutter single-family home subdivisions Sound familiar? I’m guessing that based on the 100+ (and counting) conversations we’ve had with U.S. cities and developers so far, that this time, your answer is a resounding, YES! And, I’d also venture to say that you know this is a problem, are actively trying to do something about it, are struggling with what to prioritize and how best to allocate your limited resources, and are battling the many sets of folks (even internally) not quite yet ready to join you in the “wagon.” So yes, you’ve “been” to Tigard. And damned if you do know their struggle all too well… The real question is, what are you doing about it? Here’s how we help the “Tigards” of this world address these all-too-common pains that come along with curbing an auto-addiction…(you’ll tell me when you’re tired of the puns, right? Right??). Next: Ok, so what next?